Andrew: One of the first things I noticed about “Here’s Looking At You” was that Frasier and Martin finally seem to be adjusting to each other. They got along well enough in “I Hate Frasier Crane,” but the weird approach to the fight kind of threw off my perception. But here, they don’t spend the entire episode arguing or trying to get on the other’s nerves. There is still plenty of conflict to be had between the two of them, but it’s nice to see that father and son really do love each other. I also found that “Here’s Looking At You” explored how well-written the character of Frasier Crane is. Frasier has strengths and weaknesses, but sometimes, a certain trait can be both. 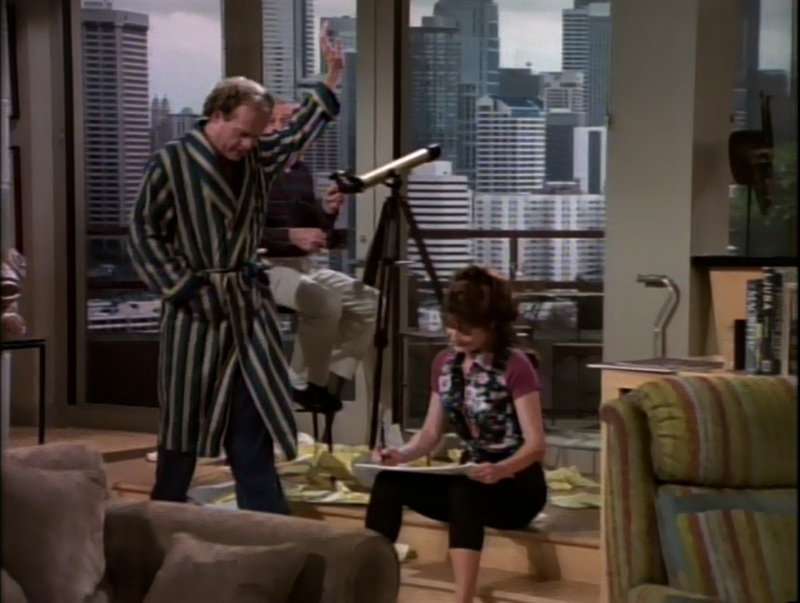 In the episode, Frasier wants to find a way to keep Martin occupied while he spends his days (figuratively) hanging around the house, so he buys him a telescope. 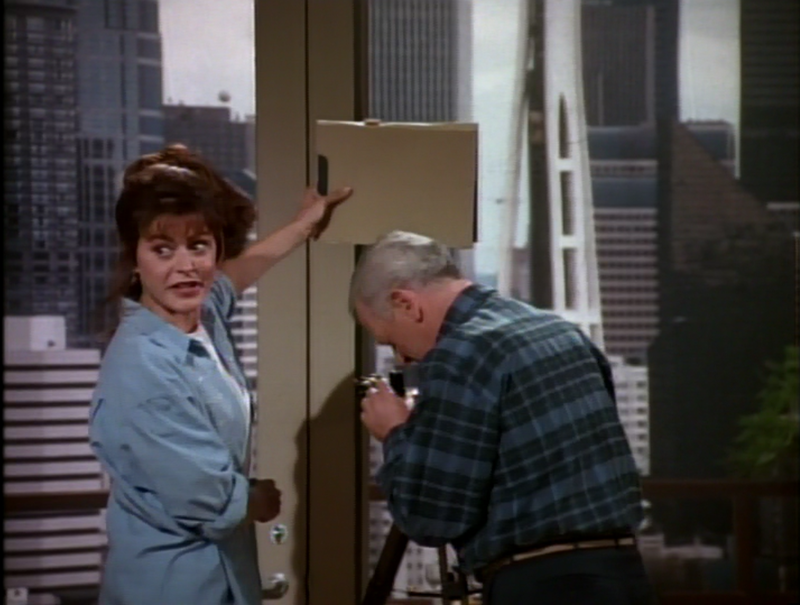 Soon after Frasier, Martin, and Daphne begin searching the city’s apartment windows for interesting sights, they come across Irene, a woman with a telescope that she uses for the same purpose. Irene and Martin begin communicating through written message, but when Frasier takes it upon himself to facilitate what he sees as a budding romance, Martin shies away. Frasier becomes obsessed with trying to figure out why Martin doesn’t want to meet Irene face to face, much to the annoyance of Martin. But Martin understands that everything Frasier is doing in the episode is out of love for his father and a genuine desire to see him happy. Whereas the Frasier in “Space Quest” might have tried to use a set-up with Irene to get Martin out of the apartment, it is quite clear that now, Frasier has accepted his father’s place in his life and is trying to do something good for him. He obsesses over Martin’s decision because he wants to understand why his father would turn down happiness. “The Crucible,” on the other hand, is a much wackier episode. And I say that with nothing but affection. Frasier is very much a farce, and misunderstandings, public embarrassments, and poor timing will drive much of the comedy over the 11 seasons. Public embarrassment is the order of the day in this episode, which finds Frasier humiliated when he invites a local artist to his apartment to view a painting of hers that he had purchased, only to learn that it is a forgery. Disaster is a foregone conclusion at pretty much every Crane party, and the series’ first sets a great precedent. But I was more drawn to how Frasier assigns so much value to seemingly inconsequential details. I understand that an artist adds value to a work, but in Frasier’s case, the name makes or breaks it. He was in such awe of the painting until he learned that it was not painted by Martha Paxton, and suddenly it became awful, an embarrassment. Ashley, do you think that Frasier focused too much on the origin of the work rather than the work itself, or do you think that the painting became associated with a bad memory of a social embarrassment? Ashley: I agree with you about Frasier’s genuine concern for his dad. He doesn’t want to get him out of the house (proof their relationship is settling down), he just wants him to have a hobby that he can enjoy. When my own father retired from the force he drove my mother and I insane. As a kid, my father would drag me along to Home Depot to ooh and ahh at the Dewalt drills and discuss the difference between semi-gloss and satin coat paint. I appreciate this engrainment of skills now but unlike Frasier, we just needed him out of the house doing something. The telescope conversations remind me very much of Internet conversations. There’s still a level of anonymity since Martin and Irene aren’t face to face, much like on the Internet. They exchange family histories, Frasier’s skin condition in the winter to be exact, much to his embarrassment. Frasier refers to Irene as Martin’s “girlfriend” and he’s immediately defensive. Frasier showing Irene their telephone number (and subsequently her call) takes away that safe bubble of anonymity Martin has with Irene. When Martin essentially ends the telescope footsie, you’re right, Frasier gets obsessed. He spends the rest of the episode trying to figure out why Martin would pass up the opportunity of a new romance. What I did find interesting was that the reason Martin gave Frasier for ending it was related to his deceased wife and Frasier’s mother Hester. However, Daphne cleverly pulls out the real reason, that Martin is ashamed of his cane. What do you think of that whole exhange between Frasier-Martin and then Martin-Daphne, Andrew? I thoroughly enjoy “The Crucible” because of the wackiness you mention. And I love a Crane Party. Ain’t no party like a Frasier Crane party because a Frasier Crane party is always a fiasco. Jubilant cherries, cockatoos attached to a scalp, collapsing chandeliers, “The Crucible” is the entryway to these wonderful tragedies. Frasier acquires this painting that he assigns an immense value to because of the artist. To answer your question, Andrew, yes I think Frasier focused too much on the origin of the work. However, I think he’s more upset that he was swindled. Frasier is a brilliant man with impeccable taste and he’s angry that someone was able to trick him into purchasing something that is essentially worthless. Someone was smarter than Frasier and gets away with it. I think that’s the real reason Frasier is angry. What did you think about Frasier’s conversation at the art gallery? I love this scene on a personal level because I’ve been in a situation like this, only I was arguing with a mechanic (Me: “You didn’t fix my alignment. I have a shredded tire to prove it” Mechanic: “It says in the computer we did the alignment” Me: “I see that, however, you didn’t actually do it.”). Frasier starts out cordial but chilly, the art gallery owner keeps skirting the issue, and then Frasier finally loses it. I love the escalation. Andrew: I loved the scene between Daphne and Martin, in which she quite perceptively deduced that Martin was ashamed of his cane and his injury. Frasier likes Daphne, but he certainly thinks he’s smarter than her (although he thinks that about most people), and he finds her odd and a bit of a loon. But it was Daphne who was able to pick up on the clues that were staring her and Frasier right in the face and put them together. Not Frasier, the one with the advanced degrees from expensive universities. It was Daphne. She doesn’t have the pedigree that Frasier has, but she is damn good at what she does. Sure, she’s funny, but she has a role on this show besides comic relief. Where many sitcoms will have characters who are comically inept at their jobs retain their employment week after week for the sake of humor (Andy and Jerry from Parks and Recreation, Sue Sylvester on Glee, Launchpad McQuack on Duck Tales), Daphne is quite good at what she does. As are Frasier, Niles, Roz, Martin, and Bulldog. 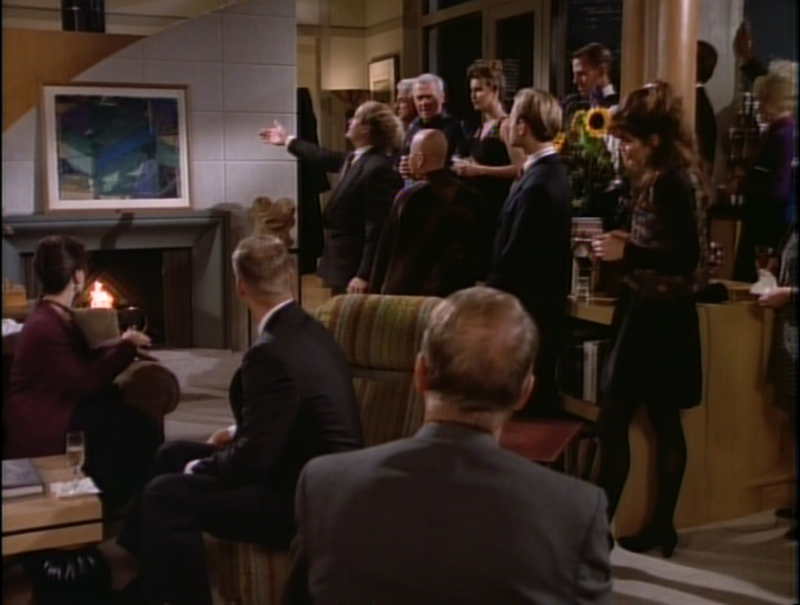 Regarding the painting, I definitely understand Frasier’s desire to get at least some of his money back. Who the artist is imbues a work with value. But it was fun to watch Frasier’s taste dictated entirely by this element. Not only that, notice how he tailored his attitude to what Martha Paxton wanted it to be. He was ready to shake the hand of someone he admired, but as soon as she told him that she does not like shaking hands, he immediately withdrew his hand and declared that attitude a delightful eccentricity. In fact, he became positively giddy when she said that, likely reasoning that an artist should have weird quirks. As Frasier and Niles are wont to do, he has elevated form over substance, encouraging a trait in an artist, which in any other person he would probably try to diagnose as a psychological problem, because in his view, it is a trait an artist is supposed to have. And yes, Frasier’s ego was bruised because he was outwitted by the gallery owner, which makes his resorting to a physical method of revenge all the more ironic. In an effort to have the last laugh in a battle of wits, when nothing else worked, he decided to pick up a brick. It’s always fun to see how Frasier’s baser instincts come out. He works so hard to present a persona of class, and yet, when he bought the telescope, the very first thing he tried to do was find someone naked to spy on. As I said, Frasier is complex and fully human; although refined tastes and base instincts seem to be contradictory, their co-existence in a single person doesn’t seem unrealistic at all. In fact, if Frasier didn’t have his less evolved side, he would seem less realistic, not more. 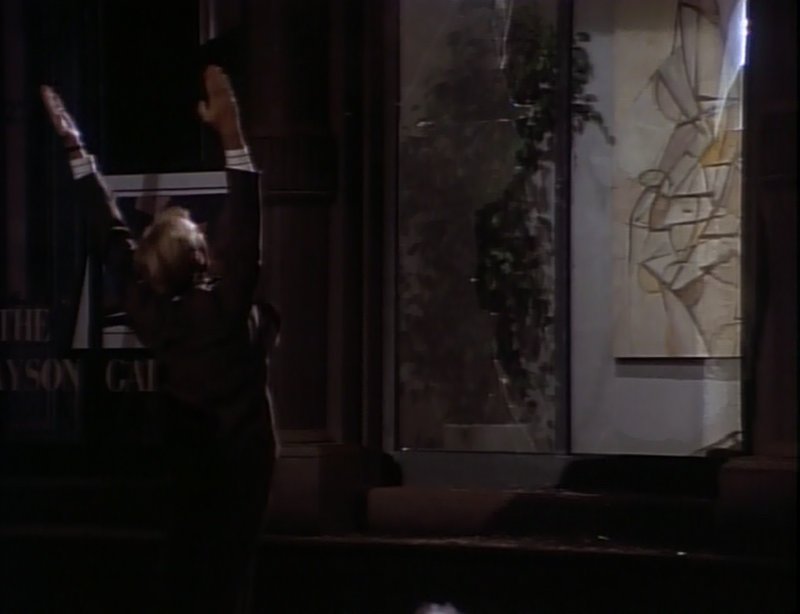 And Frasier figures out quickly what is happening at the gallery. He understands that the owner (played by John Rubinstein, who some may know as Linwood Murrow from Angel) is using psychological trickery to attempt to manipulate him. Frasier is an intellectual match for him, but at the end of the day, the gallery owner has the power. He sets the rules for the gallery, and can forcibly eject Frasier when his regular methods of persuasion don’t work. Two other things I noticed. First, this is the episode in which Martin meets Roz, and unlike Niles, who will eventually become friendly with her, these two hit it off immediately. But once again, the writers all but tell us that Frasier and Roz are not supposed to be a couple. This time, Martin tells Frasier that he should consider asking Roz out, and Frasier barely acknowledges it. Second, Martin tells Frasier that sometimes the bad guy wins and the cops and the courts won’t be there when you need them. Seeing as how Frasier likely has a pretty strong case (it won’t be hard to prove forgery if the he can get the artist to personally attest to it), what were your thoughts on this lesson? Ashley: I know in later episodes, Martin describes Daphne as the “soft center between two hard cookies” and I’m glad we get to see the beginning of that sweet glue in this episode. Daphne is more sympathetic and emotional, she understands people’s feelings. Frasier, meanwhile understands why people have the feelings they do. Finally, Martin generally evades feelings to a certain extent, skirting around them. Also, nice Duck Tales reference, Andrew. Martin’s lesson is one of the many generic lessons our parents teach us the first time we’re really cheated. He sort of brushes Frasier off with it though, maybe because to Martin, this kind of swindling isn’t that important. He even says to Frasier that the cops have more important crimes to handle. I also think you’re right about proving the forgery. However, I think Frasier would be too embarrassed to ask Martha Paxton to testify on his behalf (even though for her it’s also a big to-do since her name, her trademark, is being used without her consent to sell art). The scene with the brick is great. Who doesn’t want to exact revenge on someone when they’ve done you wrong? Frasier doesn’t stop at fantasizing about this revenge, he decides to act on it. Understanding Frasier’s high ethical and moral compass, when I first saw this episode I was surprised he escalated to this. I loved it. But I also love revenge and seeing justice prevail so, bravo, Niles “Peachfuzz” Crane for the touchdown on behalf of the hoodwinked. Andrew: It’s incredibly fun to watch Frasier and Niles descend into “barbarians” from time to time. They work so hard to suppress those urges that when they finally come to the surface, the results are pretty great. Here, nothing to outlandish happens, but we do learn that old wounds are still festering beneath the brothers’ skin. Further proof that these two people who study neuroses for a living have plenty of neurosis themselves. Which, for us as an audience, is very good news indeed. Frederick has nightmares about Senator Strom Thurmond being in his closet.